After weeks of development and bringing in talent from across the community it's time for the official release the unofficial PWE Forums Enhancement Extension! This is a user script that can be added to your browser that fixes a lot of the shortcomings of the forums and adds a ton of features on top of it. Currently supported browsers are Chrome, Safari, Firefox, and Opera. Support for Internet Explorer may come in a future update. There are several ways to install user scripts but the easiest way is typically through a browser extension like Grease Monkey. Click the above link for more info. If you already have Grease Monkey or something similar you can just click this. 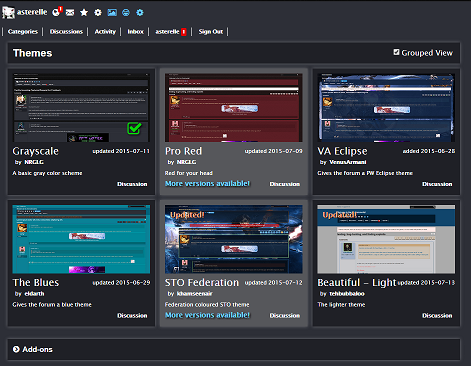 - Built-in theme manager filled with tons of themes made by talented members of the PWE community. All automatically updated with the latest versions. Lots of addons to customize the themes to your liking. Note: If you're already using a custom forum style through "Stylish" you should disable it if you want to use the bundled themes. - Editor buttons for choosing Fonts, Font Color, and Font Size. Can automatically apply your favorite font color to your posts when submitting. and they will appear in the editor. - Browse the native forums directly without any of the bugs that come with being forced to use the embedded version. - Probably a lot more! These are features that may be coming in future versions of the extension but you can try them out right now as a separate script. - Wallpapers look really stretched out. Unfortunately due to a bug Tampermonkey can not currently guarantee the script runs before the redirect occurs. To prevent the recommended that you block the redirect from happening with Ad Block. 1) Click the Ad Block button in the browser window. 3) Click 'Customize' at the top. This has been caused by conflicts with security related extensions such as "Avast Online Security". You will have to add an exception to the security or disable the extension. i will link to any themes as their threads are made. Glad to see this getting the 'official' release now that it's hit 1.0! The deeds of men remain the same..."
Definitely a wonderful job with the enhancements and bringing everything into a nice simple to use collection. Btw... I was wondering if anybody else getting threads from other categories shown under discussion. Forexample the only category I'm interested in is PWI, so I only have that category enabled or how to say it, but yet when clicking "Discussions" I get threads showing from PWI and Neverwinter. I find it annoying, I dont wanna see Neverwinter threads. Just wondering if this enhancement by any chance could fix it in future? I posted on Reddit, may as well post here too. Great work from all involved, it's nice to be able to comprehend what's actually going on now. I am curious, what tools/expertise would one need to make a theme? me too. Currently using the nice dark blue one. But I have a background picture I'd like to use instead if possible. This one or can you only do solid colours? its helpful to have some css experience, but it wouldnt hurt to try a simple 'find & replace' recolour of an existing theme. you could do that in notepad. Custom backgrounds will be coming in a future version. I am also considering expanding user blocking to allow you to block only a person's signature or only their avatar. Question about Grease Monkey. I went to the site to add it but saw all kinds of horror warnings about the latest release. What are people using then, an earlier release? These enhancements sound great, I just don't want to cripple my browser in the process. Sure, as a member of these forums I'm well up on tempests in a tea pot. I just didn't see any good comments regarding 3.x. Just curious if any others are seeing problems before I install it. Thank you to all that worked on this, much better than the "vanilla" thing we had going on before.All of these extras are very nice to have,...*chuckes* ; meh not going to go there abour ARC and how they err.....nevermind. Need help with a mission to beat it? Visit http://pilotreviewshow.com to learn how we can help! If this could also add on some toolbars that makes it easier for those looking to do custom signatures. So they could essentially add things without having to play a guessing game of what worked and what didn't. I know myself I bounce back and forth trying to determine what is and isn't working and just gave up on my signature. Loyal PerfectWorld Player & And massive hater against ARC forums. So, I have everything installed and got a Theme I like. Weird glitch is that every time I start my browser and go to these forums I have to log in for the extensions to take affect (e.g. for the Theme to take affect). Is that they way it should work, or do I have a problem setting somewhere? when i opened up my firefox earlier to test, i was not logged in and the theme still worked. i had no enhance menus nor could i change the theme, but it was still active.